Kerry parkers collections of graphic ties is the next new thing to be very honest. 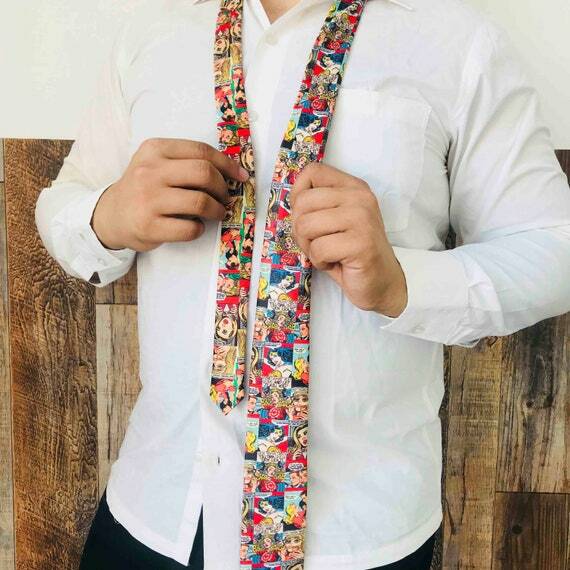 These statement ties aren’t your average everyday boring patterned ties but rather something out of the blue, that is sure to give you a laugh and also to act as fodder for your mind. They are bright colored wordy graphic ties that is sure to tie you up in knots. We normally tend to see statement tiesas an accessory that can only be used for fully formal attires with shirts, but ties have a versatility that remains vastly unexplored, be it for styling it with men’s attire or for women’s. 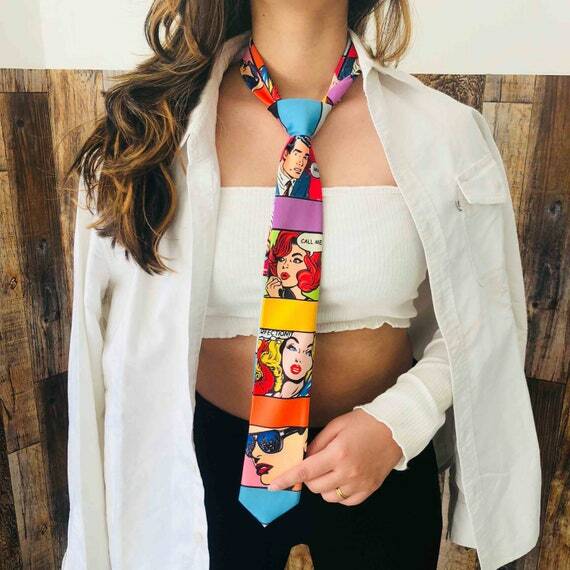 Kerry Parker successfully brings out the fun funky element with their new line of graphic ties that include range from one liners, everybody’s Favorite FRIENDS themed ties, comic ties, Marilyn and Audrey themed ties and many more. Ties despite the formality induced behind it, has such a great potential to be a fun neck accessory besides your everyday necklaces and pendants, it’s also great in order to achieve that razor sharp business look that every woman and man loves! These statement ties can be styled for any occasion be it for a power dressing business ready look or a funky accessory to up the ante of our daily style! The modern Shakespeare graphic tie with the one liner “go fucketh thyself” which comes in beautiful buttercup yellow can be paired with the powder blue power dress from Kerry Parker’s collection to give an empowered sharp and wordy look that is guaranteed to make you the cynosure of the day. The look can be completed with Kerry Parker’s mimosas 3D butterfly heels for a totally empowered look.The unisexual tie can also be styled with a summer pastel cotton shirt and polo shirts for men for a hunky funky semi formal look that screams a statement! The classic Marilyn Monroe print statement tie will work as an effortless designer accessory when paired with a formal fit and flare black dress with a sweetheart shoulderless neckline for a elegant Monroe inspired look.The simplistic unisexual tie can also be paired for a formal event with a black dress shirt and formal black pants for an extremely elegant outfit.The wonder comic graphic statement tie can be styled for a casual men’s outfit with a pale pink summer shirt and cream shorts to let the graphic do all the talking!The tie is all set to fabulous for an outfit with the Kerry Parker’s off shoulder Aurora ivory crop top and a short skirt of a bright color. The Times Up graphic tie yet another statement tie from Kerry Parker’s collection and perhaps the most important statement of the year! This power spoken tie can be paired with a white shirt and formal dark grey pants for every man who is also an outspoken feminist and against all atrocities everyone faces.Women can style this tie with a brilliant red dress for a ravishing look that speaks volumes on being bold, the look can be completed with black peeptoes heels and a black clutch with some Blingy earrings. Ladies and Gentlemen get your ever own out spoken ties with funky comic prints, quirky one liners and statement ties today at Etsy!